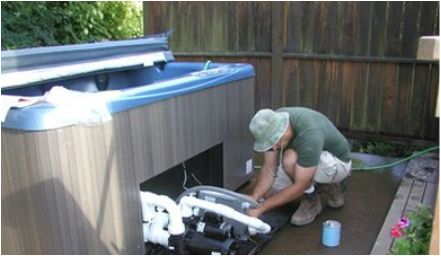 What is Driveway to Backyard Service for Hot Tubs in Denver? If you have ordered your hot tub from a store like Home Depot or Sam’s it will likely be delivered to your driveway. The problem is, how do you get your hot tub to the backyard. Hot Tubs Denver does not recommend that you try to move it yourself. Trying to move your new hot tub could result in damage to it or your property. We recommend our driveway to backyard service for all hot tubs in Denver that have this style of delivery service. The highly trained professionals from Hot Tubs Denver will bring our specialized equipment and move your Denver hot tub to your backyard all the way from the driveway. The individual airlifts and dollies that we bring to move any hot tubs in Denver will efficiently get your new hot tub into the perfect location in the backyard with no hassle. Our services are available for any spa in Denver and will help you get your hot tub to its ideal location. If you are ready to enjoy the new hot tub you bought in Denver, then our team can help you get there. Just give Hot Tubs Denver a call and we will safely move your hot tub to the backyard right away. Considering what the brand new hot tub prices are, we are confident that you want to take special care of your new investment. The primary reason that you want professionals for a driveway to backyard move for any Denver hot tub is safety. If you try to move your hot tub yourself, you could do serious damage to both your hot tub and your property. This can easily be avoided when you call Hot Tubs Denver and request our services for the driveway to backyard moving. With our experts, you will get the safest move that protects your new Denver hot tub and gets it to the desired location. If you have ordered a new spa in Denver hoping to relax only to find it was delivered to your driveway, we can help. Check out Hot Tubs Denver if you want the most efficient and cost effective move of your new Denver hot tub from the driveway to the backyard. From our great pricing to our extremely safe and productive moving team, there is no one better to move Denver spas from driveway to backyard than Hot Tubs Denver. Our efficient airlift and dollie system gets your new hot tube where it needs to be safely and quickly. We offer wonderful prices, and our team is always friendly. We always welcome questions, so if you have a new spa in Denver or are considering getting one delivered to the driveway, just give us a call. A member of our team will be happy to walk you through the entire process and give you a custom quote for free with no strings attached.